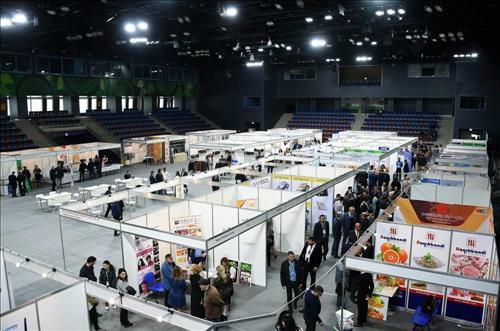 A joint trade exhibition of Azerbaijan, Turkey and Pakistan opened in Baku on April 11. Speaking at the opening ceremony, Executive Director of the Export and Investment Promotion Foundation (AZPOMO) Yusif Abdullayev noted that more than 50 companies are participating in the exhibition. More than 200 registered delegations and 10,000 visitors are expected to attend the exhibition, which will last until April 13. Abdullayev noted that this platform will contribute to the growth of trade between countries. The exhibition covers medicine, cosmetics, textiles, natural leather, sportswear, food products, tourism, construction, real estate, furniture and other areas. One of the main organizers of the exhibition is the Association of Industrialists and Businessmen of Turkey (TUMSIAD). Pakistani Ambassador to Azerbaijan Saeed Khan Mohmand said that Pakistan is considering opening a direct flight Islamabad-Baku. "This will contribute to the development of tourism and an increase in tourist flow in both countries," the ambassador said. Earlier, the ambassador noted that for the development of trade and economic cooperation, an important step is the opening of direct flights between Azerbaijan and Pakistan. 'Cross-border trunk railways can also contribute to this. If we consider that Iran is adjacent to both Azerbaijan and Pakistan, then the implementation of Baku and Tehran of the necessary steps to improve the railway infrastructure of the two countries can help regional states to increase trade. He said that the mutual trade between Baku and Islamabad increased from $ 8.5 million in 2016 to $ 16 million in 2018. 'Pakistan supplies rice products and vegetables to Azerbaijan, but, unfortunately, these supplies are not at the level we want. From this point it is important to hold such exhibitions, the ambassador stressed. At the exhibition, the president of the Association of Industrialists and Businessmen of Turkey (TUMSIAD), Yashar Dogan, said that the fraternity between the three countries has historical roots. He noted that Azerbaijan, Turkey and Pakistan have great potential for increasing trade. The volume of mutual investments between Azerbaijan and Turkey amounts to $30 billion. However, trade turnover with Azerbaijan is $2 billion, with Pakistan - $1 billion. Dogan also noted the important role of small and medium enterprises in the economy of each country. In his opinion, it is necessary to do everything possible for the development of entrepreneurship between the countries. The head of the TUMSIAD Pakistani office Chundari Anis Igbal noted that this forum will expand economical ties and increase trade turnover between the three countries. "I believe that such forums should be held annually in each country in turns. We decided to organize the first such forum in Azerbaijan," he said. Previously, the State Oil Company of Azerbaijan (SOCAR) has signed an agreement on the supply of Azerbaijani oil to Pakistan for $ 100 million. Last week, in Islamabad, an agreement was signed on Azerbaijan's supply of its oil to Pakistan in the amount of $ 100 million. According to the agreement, SOCAR Trading will sell oil products to Pakistan in the amount of more than 1 million tons per year. Currently, only Kuwaiti KPC (Kuwait Petrolium Company) has the right to supply oil products on a long-term basis. With the signing of the contract, SOCAR will become the second company after KPC, which will supply oil products to Pakistan within the framework of a long-term contract. All other companies sell petroleum products as tenders.